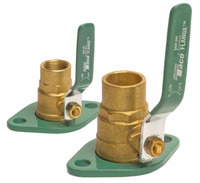 Taco Shut-Off Swivel-Flange® sets combine a full-port ball valve and companion flange to isolate system circulators for easy removal and service without draining the system. Simplify your next 00® circulator installation while saving material and labor costs. Solid brass uni-body construction, available in ½" - 1½" NPT or Sweat connections. The Swivel-Flange allows easier installation and convenient positioning of the pump and lever handle.